It’s Halloween — here’s your treat! … these will do quite nicely, thanks very much. I was originally planning to post some scans from Superman vol. 1 #344, where he fights both Dracula and Frankenstein’s Monster, but a) I’d pretty much already done both of those, and b) the issue wasn’t as good as I remembered it. Basically, the Phantom Stranger shows up at the end, and pretty much wishes Dracula out of existence. Ho hum. So while the bit I did choose for today may not strike you as particularly Halloween-y, keep in mind that it is, nevertheless, about as close to the Devil as the post-Crisis Lex Luthor has ever gotten. As for the last of my Halloween scans, come back Wednesday for the big finish! We begin this week with Teen Titans #52 (written by Sean McKeever, pencilled by Jamal Igle, inked by Marlo Alquiza, Jesse Delperdang, and Rob Hunter), essentially a series of fight scenes involving the Titans, their future (evil) selves, and various (present-day) DC bad guys being mind-controlled by Starros. The overall point of these scenes, though, is to play up the contrast between the “whatever it takes” Titans of Tomorrow and our more idealistic heroes. I liked it for the most part, although I have trouble getting into relatively new characters like Kid Devil, Ravager, and Miss Martian. (Kid Devil and Ravager I remember from their original incarnations, but there’s been a lot of water under both of those bridges.) I do like Jamal Igle, though, and he made this action-oriented issue flow nicely. He especially draws Blue Beetle well, with one funny panel towards the end conveying BB’s desperation perfectly — a very Steve Rude-like moment, in fact. I mean, I like McKeever’s work here too; don’t get me wrong. The issue could have been fairly tedious, but there is enough individuality in the voices to make each confrontation slightly different. Green Lantern Corps #17 (written by Dave Gibbons, pencilled by Pascal Alixe, Angel Unzueta, Dustin Nguyen, and Patrick Gleason, inked by Vicente Cifuentes, Rodney Ramos, Rob Hunter, Marlo Alquiza, and Prentis Rollins) made me wonder how “Sinestro Corps War” will read in collected form. This issue shows the invasion of Earth from the GL Corps’ point of view, and weaves in and out of the last Green Lantern, the Super”man” Prime Special, this week’s Blue Beetle, and probably the Cyborg Supes Special too. Kilowog fights Arkillo in San Diego — where, yes, the Convention Center is trashed — and Sodam Yat takes on the Anti-Monitor. As with Teen Titans, lots of fightin’ and carnage. There aren’t a lot of clashing styles among the squadron of pencillers and inkers which put together this issue, so that’s good. It doesn’t feel like there was no plot advancement, although the big reveal at the end shouldn’t have been too surprising to anyone who’s been paying attention to the solicitations. Likewise, if all you read is this comic, then it does a good job of bringing you up to speed on the crossover. For the rest of us, though, it’s good to see the GL Corps win some battles, but it’s a little past time for things to start wrapping up. Also marking time is the Tales of the Sinestro Corps: Superman-Prime Special. The main story is, of course, the cover feature, written by Geoff Johns and drawn by Pete Woods and Jerry Ordway. Since the star of our show is a teenager from “this” Earth, where superheroes are just fictional characters, it takes an appropriately metatextual tone. It therefore also goes back into Johns’ Infinite Crisis mindset, where he’s using a villain to criticize what could easily be argued is his own approach to some superhero stories. Accordingly, it’s never quite clear whether we’re supposed to feel sorry for the former Superboy-Prime, or just treat him as an emo whiner. Certainly the superheroes of DC-Earth prefer the latter, because they pound on him across the globe as he tries to reach an area of sunlight to recharge his batteries. 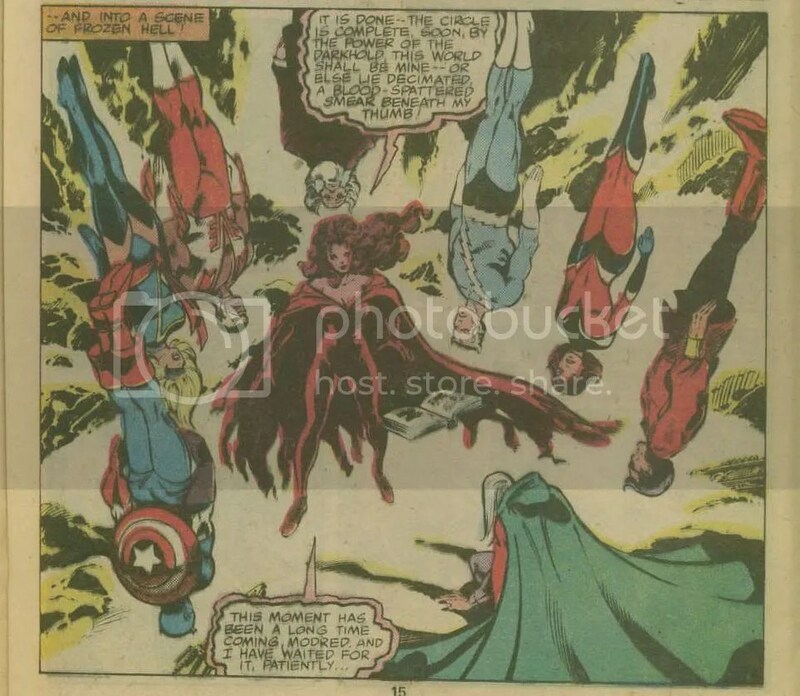 Between this and Amazons Attack, Pete Woods is becoming the go-to artist for well-choreographed superhero dogpiles, and his work is similarly effective here. He might not be thought of as a detail-oriented artist like, say, George Perez, but he’s good at crowd scenes and closeups both. The second story, written by newcomer Sterling Gates with art by Ordway, is a backup featuring the Sinestros’ librarian/Crypt-Keeper, Lyssa Dark. It’s creepy and unsettling, but mostly because it focuses on a Sinestro which kidnaps babies and stows them in a skin-pouch on its back. As is the custom, you see. It’s the kind of thing you admire on a technical level but could stand not to read again for a while. It goes without saying that Jerry Ordway is always good; and Gates does well with what may be his rookie assignment. JLA Classified #45 (written by Justin Gray, pencilled by Rick Leonardi, inked by Sean Phillips) was just confusing after a while. There are two big twists in the issue, one involving where the mental combat is taking place and the other identifying with whom, and both are identified rather subtly. Most of the story to date has been J’Onn fighting off “deviant memories” (for lack of a better phrase) of the JLA, so when the real JLA starts getting involved, it’s harder to tell. It’s a problem with the spare storytelling style generally, I think. If it’s meant to be disorienting, then it worked; but it’s still kind of frustrating. 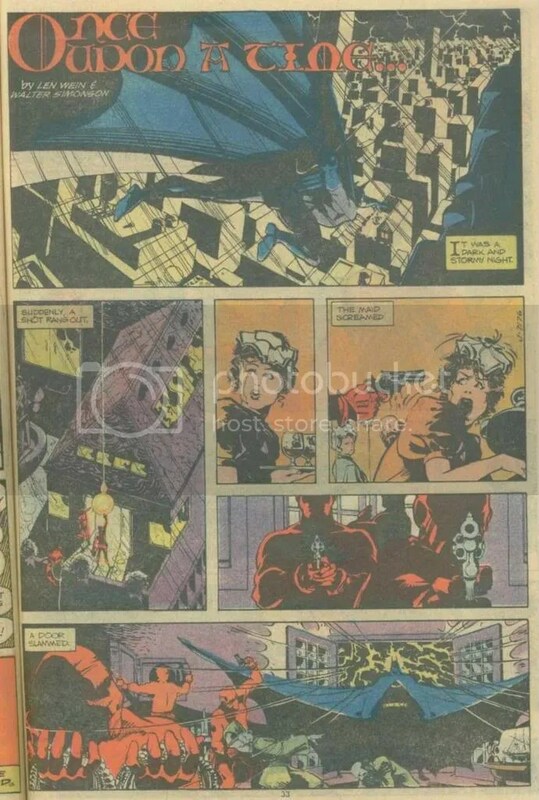 I don’t have much to say about Countdown #27 (written by Paul Dini and Sean McKeever, breakdowns by Keith Giffen, pencilled by Carlos Magno, inked by Rodney Ramos). It didn’t really offend or dazzle me. It almost reminds me of the kind of comic Ninth Wonders (the comic-within-the-show on “Heroes”) must be like. I imagine someone in a larger story using an average issue of Countdown as a guide to the “real” story’s plot. (“Look, Hiro! Buddy Blank and Karate Kid are in Bludhaven! That means the sword has returned to Las Vegas!”) Or, you know, maybe I’ve got too much sugar in my system from that “one last” donut. 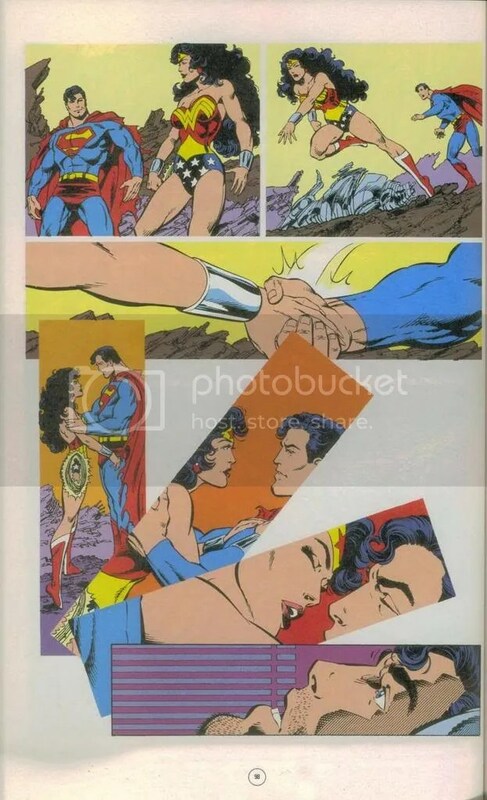 When the word came down that the next big Action Comics arc would be a Bizarro story, I cringed, fearing it would compare unfavorably to the excellent All-Star Superman Bizarro two-parter. 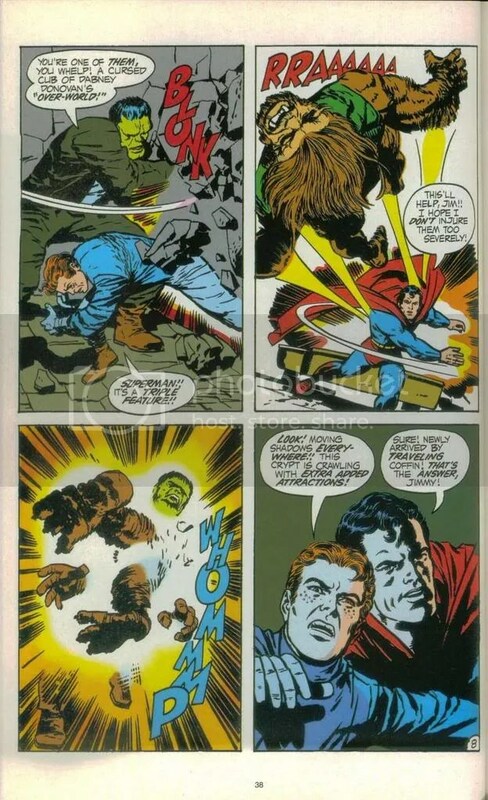 However, “Escape from Bizarro World” (part 3 of which appears in Action Comics #857, written by Geoff Johns and Richard Donner, and drawn by Eric Powell) actually turns out to be pretty good. Powell’s art is a big part of it, naturally — it’s a combination of cartooning and menace which even reminds me of Charles Addams a little bit. Johns and Donner, who I feared would try to ground the Bizarros in reality, thankfully go the other way here, perhaps justifying their flights of fancy through the Bizarro-World setting. Overall, I liked it, and think it stands well on its own. Back in the flagship title, “The Third Kryptonian” rolls on in Superman #669 (written by Kurt Busiek, pencilled by Rick Leonardi, inked by Dan Green). I liked this one too on first read, but I can see where some might recoil at its suggestion of a starfaring Kryptonian Empire, with its corollary that Superman was just one of many survivors of Krypton. I’m reserving judgment, though, until the end. Basically, this issue is an extended flashback recounting the history of the Third Kryptonian, and in technical terms, it’s put together as well as the previous one was. 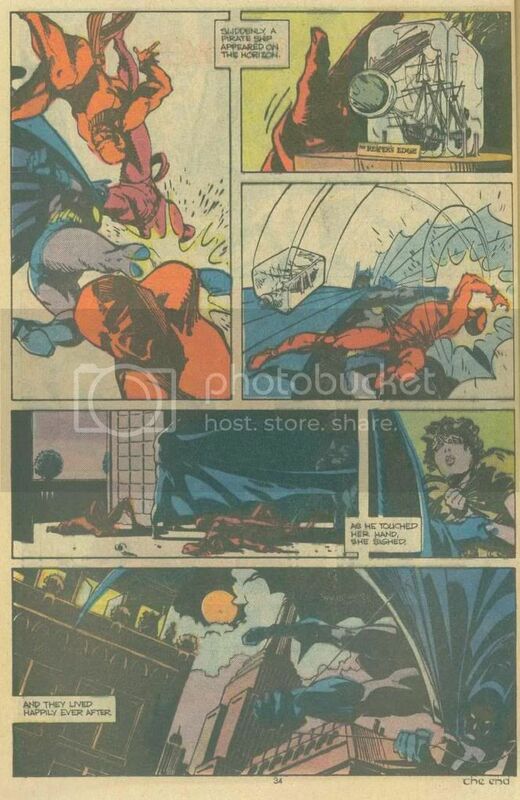 The Flash #233 (written by Mark Waid, drawn by Freddie Williams II) is by now more infamous across the comics internets for its takedown of Batman’s parenting skills, but I thought it was a decent wrap-up to the invasion of the water-based aliens. Williams is a fine fit for the book, although his Wally is a bit beefy. Waid works in another “Look! Up in the sky!” joke (following last week’s Brave & Bold #7) which works better here. The backup is drawn very nicely by Doug Braithwaite, and Waid gets a writing assist from John Rogers, telling a nice little story about Jay Garrick helping the people of “Planet Flash” throw off the yoke of oppression. 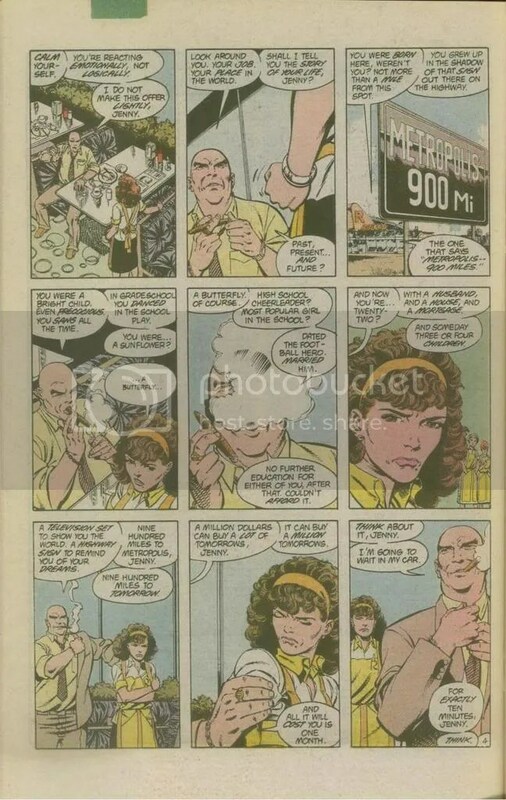 Finally, here’s Peter David’s first issue as writer of She-Hulk (#22 pencilled by Shawn Moll and inked by Victor Olazaba), in which we are introduced to Jen as a bounty hunter. It’s a significant change from the Slott status quo, but it’s not an intolerable one, and it includes a couple of big questions and a cliffhanger. The art is good — big panels and clean lines — and somewhat reminiscent of Gary Frank. I’ll be back next month. JIMMY OLSEN MUST … oh, you heard that one already? The monsters are mad at Jimmy because he reminds them of their tormentor, an evil genius who’s been manipulating them for his own amusement. Insert Dan DiDio joke here, I suppose…. It’s from Jimmy Olsen Adventures By Jack Kirby Volume 2 — something to look forward to if you haven’t read it yet, Bahlactus! I admit freely that I am excited about this book. I get a lot of joy out of nerd reference, and the Michael Fleisher Encyclopediae are already good resources for the Golden and early Silver Ages. However, it strikes me that, as currently described, the Greenberger book may well end up being a de facto DC encyclopedia. 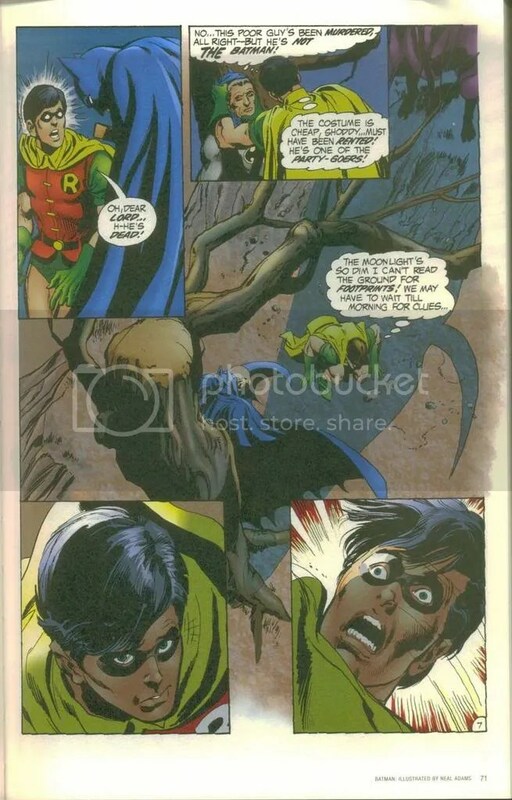 “Every Batman comic book appearance in the DC Universe” could conceivably include his adventures with the Justice League and Outsiders, to say nothing of the Robins’ involvement with the Titans and Young Justice, or even the Golden Age Batman’s adventures with the All-Star Squadron and Justice Society. 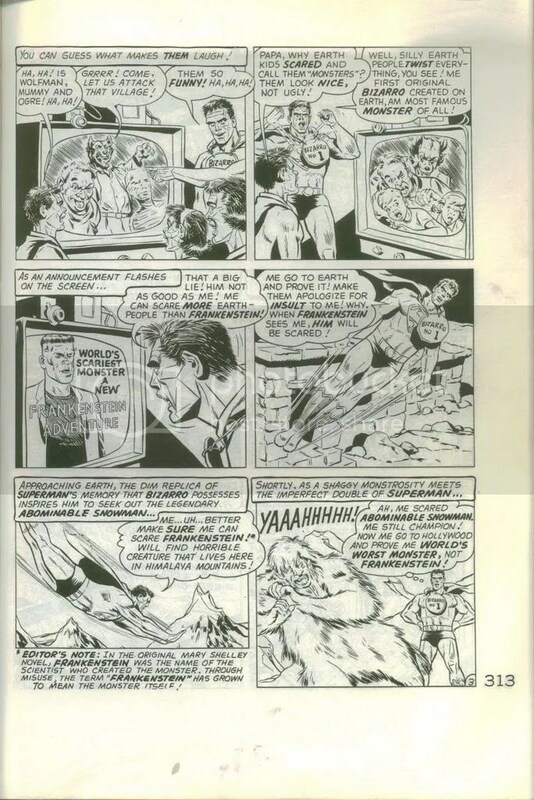 The Fleisher volume had brief entries on the Elongated Man, Superman, and the Legion of Super-Heroes, based on those characters’ team-ups with Batman in Detective and World’s Finest. 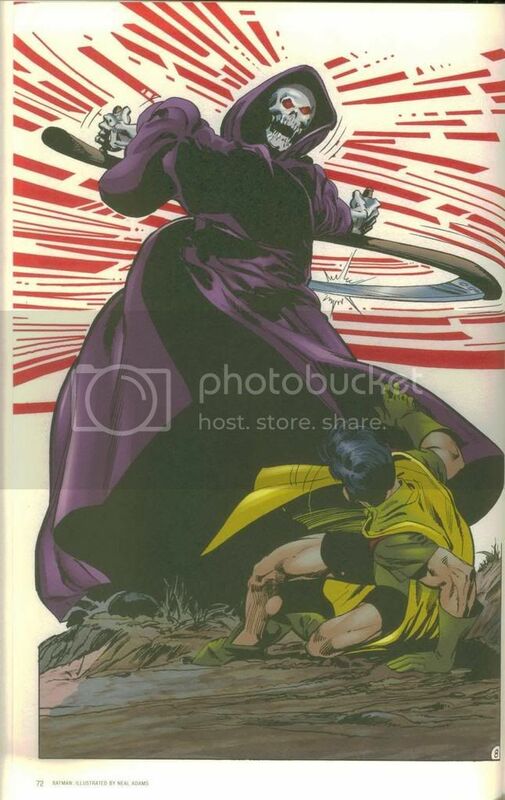 However, by the same token, you’d think the new volume would have entries on everyone who’d guest-starred with Batman in The Brave and the Bold, plus most members of the Justice League, Justice Society, Marvel Family, New Gods, Checkmate, Suicide Squad, Teen Titans, New Titans, Birds of Prey, Young Justice, Challengers of the Unknown, Outsiders, Injustice League, Secret Society of Super-Villains, Fearsome Five … you get the idea. Therefore, I can’t expect Greenberger’s book to be as comprehensive as the description might suggest, but realistically there’s no way it could be. It should still be a fun read, though, and a great resource for many years to come. Plus, you’d think all that research would make the inevitable Superman update that much easier. I think it still works as a soliloquy, even without all the exposition, but I can tell you’re skeptical…. First, a page’s worth of context. See, because Clark “thinking” with his … well, never mind … probably wouldn’t have counted with Diamondrock. Good thing he woke up ready for some regular good ol’ wholesome THINKING!